Exciting stuff has been happening around here, yet I’ve hardly had time to post about it. 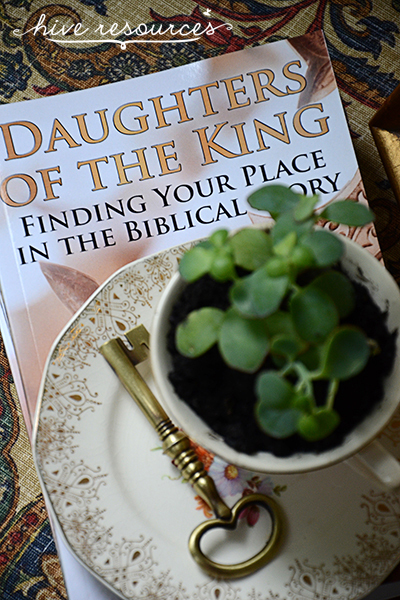 This summer, I turned my eBook, Daughters of the King: Finding Your Place in the Biblical Story , into a paperback! Although I love using the Kindle app on my iPhone, you just can’t beat the feel of real pages under your fingers. I suspect I’m not the only one who holds this opinion, so my book is now available as a paperback. 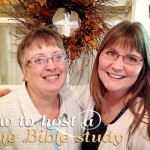 I hope this will make things easier for your fall small group as you consider your next Bible study or book club. To help me celebrate the paperback launch of Daughters of the King , my friend Kristen from Celebrate Every Day with Me, threw a big bash at my house a few weeks ago. 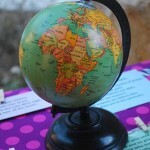 I am such a fan of her site, that I knew I needed her eye for detail and fun! 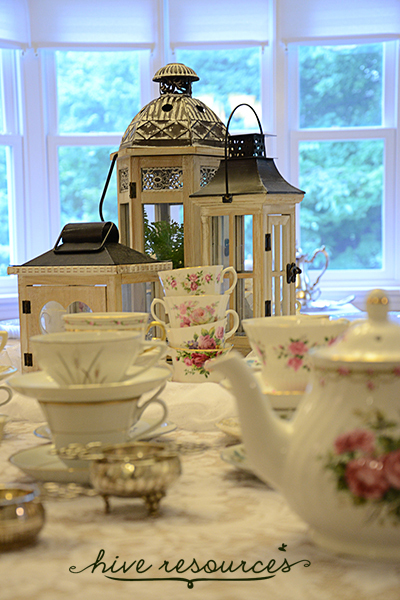 She’ll be posting about some of her ideas in the coming days, but I thought you might like a sneak peak at our tea-themed soirée. 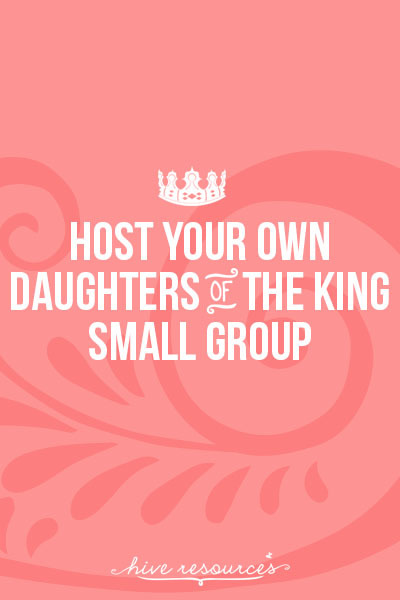 Many of these ideas can be replicated for your own women’s ministry tea or kick-off event to your Daughters of the King fall Bible study. Here’s a little inspiration to get you started. On our menu we offered a variety of cakes and a fruit tart that disappeared in seconds – all made by my amazing culinary friends (thank you notes are forthcoming!) I made scones with fresh clotted cream and strawberry jam. (The day after my party, I had the best breakfast! You can’t beat cake with morning coffee). I served one of my favorite hot teas, Ginger Peach Tea , and coffee for all my addict friends. We set up the food as a buffet and everyone was able to serve themselves, picking and choosing what made their heart sing. 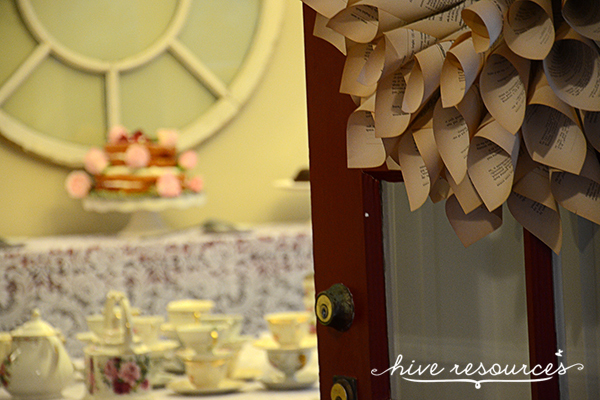 Kristen oversaw every detail, like this amazing wreath made out of vintage book pages. (Yes, she is planning on offering a tutorial on her site very soon!) Imagine how cute it would be for a back-to-school party! 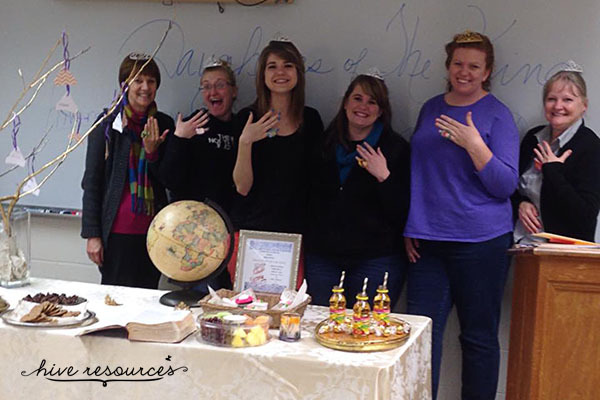 Her best idea, however, was the Daughters of the King photo booth, complete with glittered crown and scepter props. She even included white gloves and paper tea cups! So, as a part of the launch, I asked a friend who works with a local rescue ministry in Pittsburgh – Living in Liberty – to come to the launch and share about the hope they provide to victims of trafficking. 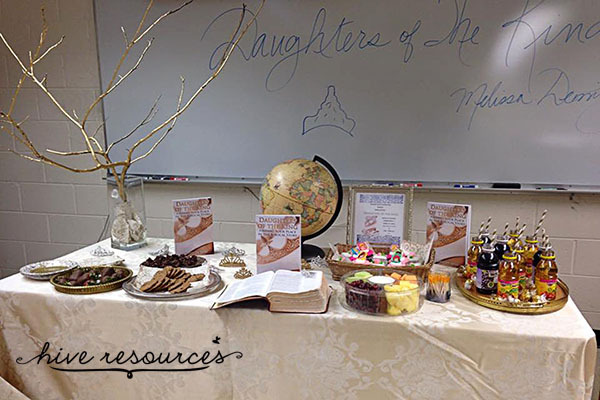 During the party, we were able to raise over $300 in book sales for this crucial ministry. So, thank you to everyone who purchased a book at my party! 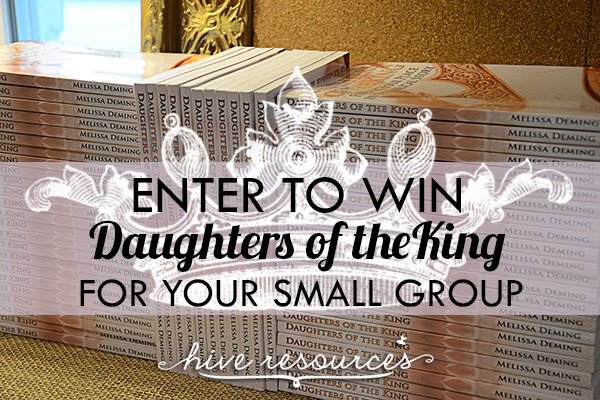 (1) Purchase your copies of the Daughters of the King or enter to win a set below. (2) Gather your tea cups. I found most of mine at auctions and thrift stores. While I loved visiting antique shops, they tended to be a little pricey. 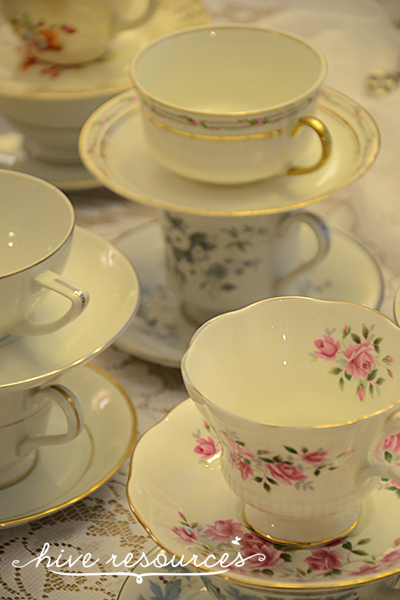 Estate sales are also a gold mine for adding complete sets of tea cups to your collection. 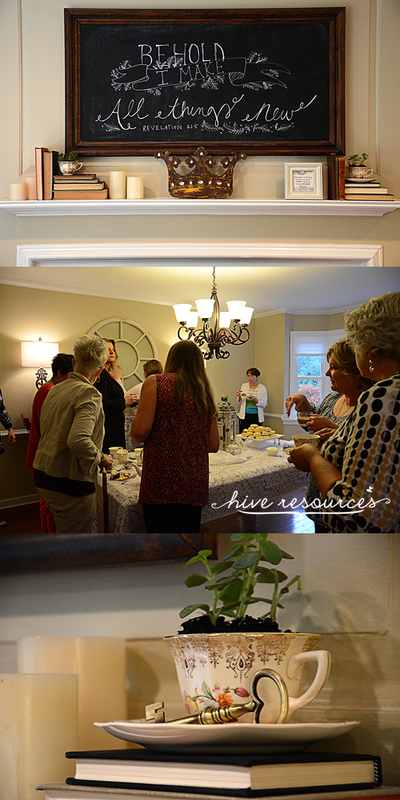 If your group is large, then ask each lady to bring 3 things to the party – two tea cups and a friend. (3) Select a local ministry in your area or within your church and suggest a donation to be collected at the party. If possible, invite a representative from the ministry to share at the event. For easy donation collection, coordinate withe the ministry to use the paypal app and free reader for participants to donate via paypal, check, or credit card. (4) Print out some of these free printables to decorate your tables or to set up your own photo booth. This above printable pack (click image to download) includes book quotes, menu cards, and more! You can download an invitation – ready to be customized – HERE. Now, for the giveaway! 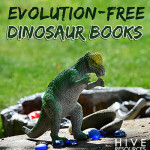 Enter below to win a set of books for your small group (up to 10). Contest HAS ENDED. Winner announced below! Thank you to everyone who entered! 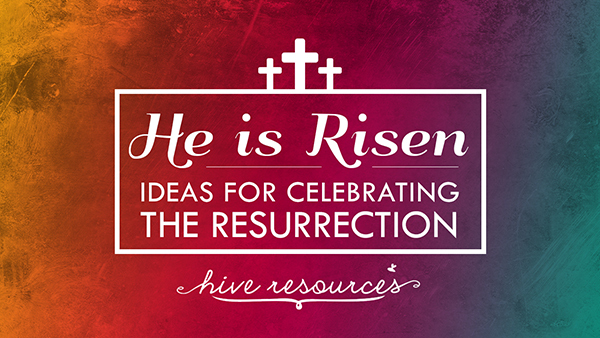 Happy Easter from Hive Resources! I hope you have a wonderful week celebrating our Savior’s resurrection this weekend! I’m not posting very much this week so I can maximize my time with my littles. 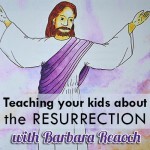 We’re reading books about the Easter story, doing some fun activities, and exploring the resurrection with our Easter Story Eggs. 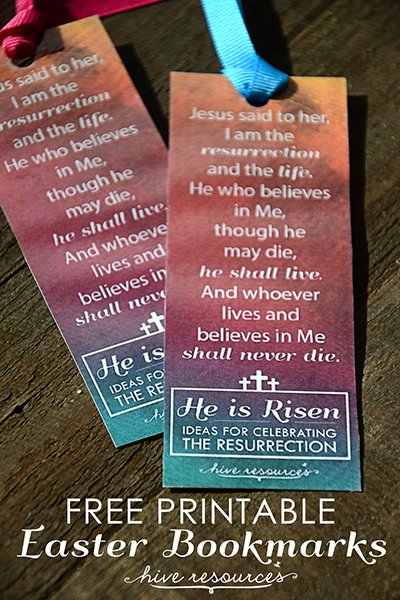 Here are some free printable bookmarks you can add to your Easter baskets or Easter cards! Simply click the image above to download (give’em a chance to load) and then print! Paul begins his “love chapter” by reminding the Corinthian church that good deeds, ministry, and special talents are meaningless if they aren’t performed in love. Without love, we garner no special points, worthy accolades, or enduring legacies. So, if we don’t gain anything by good deeds without love then what does profit us? Paul tells us in verses 4-7. Love profits us. Love brings us worth, value, significance. But, not just any love. The love to which Paul refers in 1 Cor. 13 is a higher love. Agape love is a deliberate choice made by a Lover to act despite any unworthiness in the object of affection. This love is the heart of the gospel. It’s active, and it’s oriented outward. 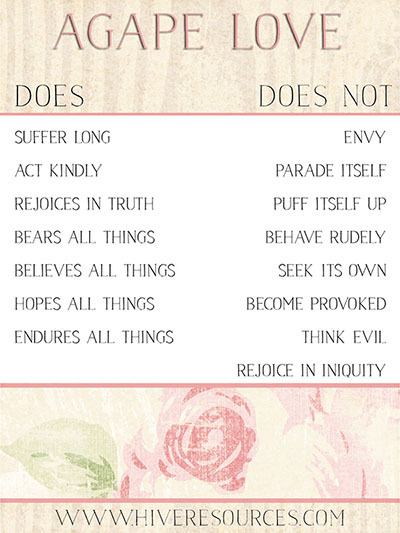 In fact, in verses 4-7 Paul defines true love by what it does and doesn’t do. Is love just another to-do list? Verse 4-7 are extremely convicting for me both as a mother and a ministry-minded woman. Each time I pick through these verses, I’m confronted with the shady areas of my heart and life. When I lose my temper with the boys. When I respond to childish behavior with sarcasm. When I automatically believe the worst in those around me. Then the familiar guilt and shame seep in, and I tell myself I’ll do better next time. I resolve to get my act together, get my anger under control, to use kind words instead of stinging ones. And then, all of the sudden, Paul’s “love chapter” has become a to-do list that is hopelessly heavy for these mommy-shoulders to bear. And before I know it, I’ve fallen into the same trap as the first-century Corinthians – believing I can do something (anything) without the help of the cross, and feeling very smug when I do, but exhausted and depleted when I don’t. I’ve become guilty of committing a hate crime instead of walking in true love. You might think good intentions don’t count as a hate crime, but I’m not sure they can be classified as anything else. Without love there is no neutral territory on which to stand. Just as the absence of light is darkness, the absence of love is hate. 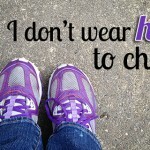 When we aren’t walking in love, we’re walking in self-love – a love that ultimately seeks to please self over others. The only way we can walk in agape love is to dwell in Him who is Love. That’s why I wanted to memorize 1 Cor. 13, because it is only through abiding in Him and His Word that we give His Spirit room to work in our lives. By internalizing God’s Word, we give the Spirit room to recalibrate our heart’s natural default mode from self-centered love to selfless love. The love of Christ is our power. His love changes our hearts and enables us to act in self-less ways. This is why the Corinthian church was in shambles. They were following to-do lists instead of living in the power of the cross. But to-do lists without love are merely prisons of hate. As a mom, I don’t want my kids to see their mother behind the bars of anger or impatience. I want them to see a woman walking free of fear and full of joy…and yes, love. What about you? In your station of life (motherhood or ministry), how does the love of Christ equip you to love others? Did you miss the first part in this series? 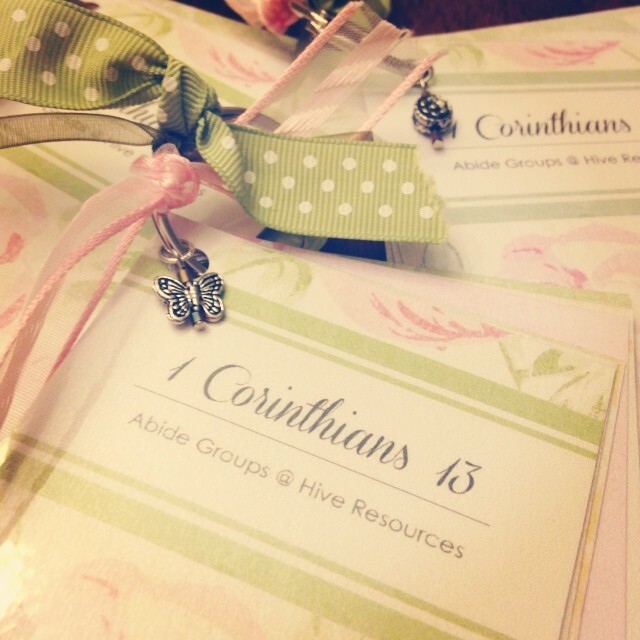 Get your free printables of 1 Cor. 13 here and notes for vs. 1-3 here! Dorothy Patterson, ed., The Woman’s Study Bible (Nashville: Thomas Nelson Publishers, 1995), 1918. Hi there! Welcome to Hive Resources. I’ve been waiting for today for a long time! Today, I get to unveil my site’s recent makeover by the uber-lovely French Press Mornings. 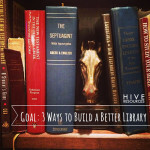 We’re still busy bees adding some finishing touches to the site, so stay tuned and pardon our dust! Last week I challenged you to memorize 1 Cor. 13 along with me. 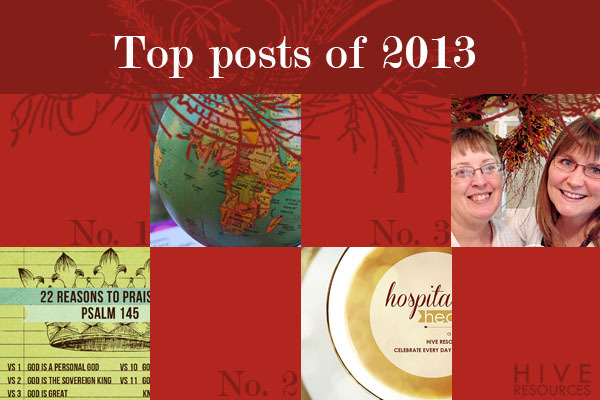 I was excited to hear so many of you desire to press into 2014 by abiding in Him and His Word. Today, we’re talking about verses 1-3. 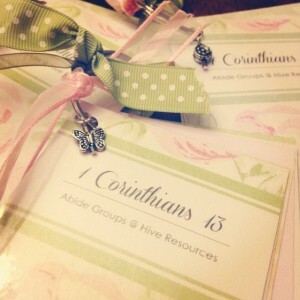 Have an Abide Group? Download 1 Cor. 13:1-3 Talking Points (including Background and Context). 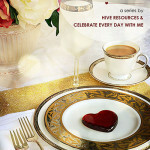 With Valentine’s Day around the corner, it is easy to embrace 1 Cor. 13 as the pinnacle of romantic love. It is read at weddings and written into many Valentine’s cards as a passionate display of emotion between two people. But romantic love was not on Paul’s mind when he sat down to write 1 Corinthians. It pained him to write this letter. His guts were in knots over the reports of doctrinal and moral failures that were coming out of the church of Corinth. So, if Paul’s mind was far from love stories, what kind of love was he writing about in 1 Cor. 13? The love God lavishes on his children. The love God poured out and into his church so they can pour it out to others. True agape love – God’s deep and abiding love for us (1 John 4:9) and the appropriate loving response to him (John 15:10). The church at Corinth had failed miserably in this aspect. They had become a true and ugly reflection of the city around them – adopting their sins and selfishness. Chapter 13 falls in a section of the letter dealing with orderly worship in the church (1 Cor. 11:2-14:40) – particularly how the church had misused their spiritual gifts (1 Cor. 12:31b-13:13). Some in the church were using their gifts for personal gain instead of building up the entire body (1 Cor. 12:12-31). They had left out a crucial element in their service – love – and were causing dissension. In the previous chapter, Paul reminded the church that it doesn’t matter what spiritual gift you possess, but the way you use it. Apparently, some in the church were making a big deal about certain types of gifts. Even today, we have a tendency to elevate those among us who are gifted communicators, speakers, and teachers. We become personality-driven instead of driven to the Person who gifts us for service. Without the rest of the band, a clanging symbol is loud, ineffectual, and detrimental to growth. Not to mention really annoying. It doesn’t matter if we are gifted communicators (vs. 1). It doesn’t matter if we know the Bible backwards and forwards (vs. 2). It doesn’t matter if we appear to perform spiritual feats (vs. 2). If we accomplish those things without love as our primary motivator, we are still nothing to the One who is Love. It doesn’t matter if we give away all our food and goods to the poor (vs. 3). It doesn’t matter if we deny our own needs, even giving ourselves up to be martyred (vs. 3). All those things can be accomplished without agape love. Good works aren’t enough – not enough to soothe guilty consciences, not enough to make up for past wrongs, not us to “get us to heaven,” or to make us right with a holy God. How easy it is for me to forget God’s love when I’m serving in an area of church I don’t enjoy! How easy it is for me to forget God’s love when I’m holding down the home front and correcting my children! Without love, my service doesn’t garner me any special standing. Without love, my spiritual gift becomes ineffectual. His love is the motivator. His love is the equipper. His love is everything. When do you find it is the easiest to forget God’s love? How do you remind yourself to replace God’s love as your heart’s primary motivator? If you’re just now getting this little invitation, it’s not too late to join us! 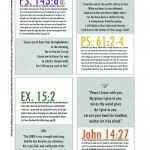 Simply print out a copy of these free Scripture cards and grab a friend. Mare, W. Harold, The Expositor’s Bible Commentary, Vol. 10 (Grand Rapids: Zondervan Publishing House, 1976), 267. Happy 2014! I’m excited to see what God has planned for our family in 2014. I don’t have any New Year’s resolutions this year, but I do have a few goals. In parenting, I hope to finish strong in homeschooling the twins. My goal is to teach them to read before they start Kindergarten next year. I fell in love with the written word long ago and hope I can pass that passion onto my boys. In spiritual matters, I have one goal – to abide. In 2013, our family made many investments in Christ’s kingdom. And while they were all good and worthy endeavors, I realize that I wasn’t fully tuned into Him for many of them. This year, I hope to abide deeply in Him by abiding in His Word. To keep me accountable in this area, I solicited the help of a friend I’m mentoring and her momma. We are memorizing 1 Cor. 13 together and will meet each week to recite our part of the passage and discuss it. I’m calling it my Abide Group. Wanna join? Here’s how it works: Grab a friend, coworker, neighbor, or a mentor/mentee. 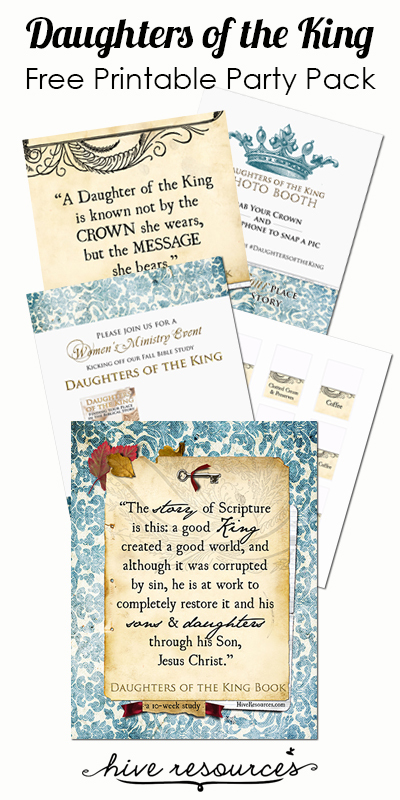 Download and print a set of these free printable Scripture cards for each person in your group. 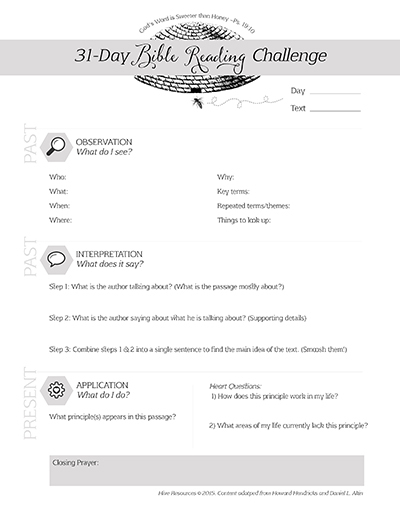 (Click the image to download the printable PDF). Meet once a week to talk about it. That’s it! Pretty easy, huh? If you don’t have anyone to join you, then tackle these by yourself. 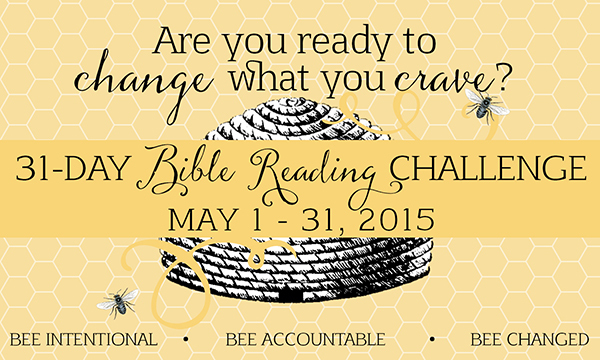 You can check-in on the Hive Resources Facebook Page and post a status report or a question about one of the verses! It’s my personal hope that by the time Valentine’s gets here, my heart will be saturated in Christ-like love. I don’t know about you, but I need that kind of help as a mom and wife! I’m ready to Abide in Him 2014! Are you? Leave me a comment if you’re in! We’ll lift each other up! Special thanks to the SugarPlum Paperie for letting me use her lovely notecards for this project. You can find more cute printables in her shop. 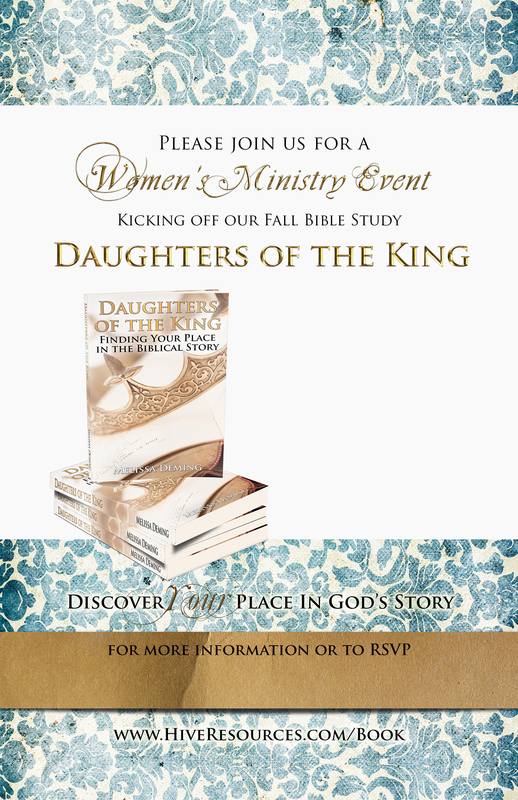 This week I released an eBook about a woman’s identity and role as a Daughter of the King. But I realize that not everyone knows this King or what’s so special about him. 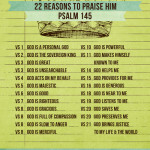 Here’s 15 reasons our King is worthy to be praised, and 15 reasons the title Daughter of the King is the best title we could ever crave. 1. Our King is eternal! 3. Our King is mighty! Ps. 24:7-10, “Lift up your heads, O you gates! 4. Our King is sovereign! 5. Our King is active in our lives! 6. Our King is compassionate! 7. Our King is above all gods! 8. Our King deserves our praise! 9. Our King will be our King forever! 10. Our King is holy! Is. 6:5, “Woe is me, for I am undone! 11. Our King is the Judge! 12. Our King is unique! 13. Our King is humble! Zech. 9:9, “Rejoice greatly, O daughter of Zion! 14. Our King is one! Zech. 14:9, “And the Lord shall be King over all the earth. 15. Our King is the King of Kings! Have you entered to win 1 of the 3 Dayspring crown necklaces I’m giving away to celebrate my book launch? Enter here! 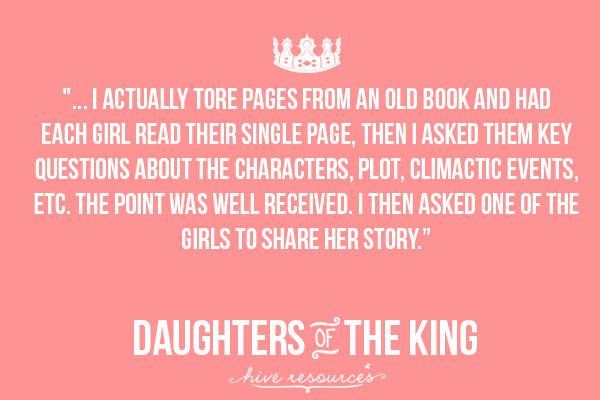 And don’t forget, this week you can get 30% off the PDF of Daughters of the King with the code FALL13! But hurry, the sale ends Sept. 30th. Click the image below to find out more!